Soft and light homemade gnocchi tossed in a simple yet delicious brown butter and sage sauce. 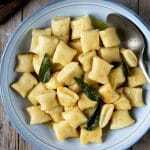 Whether you make the gnocchi from scratch or choose storebought this simple dinner has a beautiful flavour which fits both busy weeknights or an elegant dinner party. Whether you're using homemade or storebought gnocchi bring a large pot of salted water to a boil and add the gnocchi. Meanwhile, add the butter to a large pan. When the butter starts to foam add the sage leaves. Watch the butter swirling from time to time until the butter starts to brown then turn off the heat. This should only take 1 minute or 2. When the gnocchi floats to the top of the water remove them with a slotted spoon to the butter sauce. The added water will sizzle in the pan and gives added flavour to the sauce. Toss the gnocchi in the sauce and serve. Use a light coloured pan, if you're unsure. It helps keep track of the colour of the butter whilst it's browning. Add the sage or herb of choice when the butter starts foaming. When the butter starts to foam watch it carefully and swirl the pan once or twice until it starts to brown. When the butter is a light brown colour remove it from the heat to stop it burning. This sauce only takes 1 minute or two to make so make sure your pasta, gnocchi or whatever you're serving it with is almost ready when you start it. If you're making the sauce to serve over or with meat then cook the meat first and start the sauce as the meat rests. Toss with fresh pasta with lashings of freshly grated parmesan cheese. This is another simple favourite, I have a similar recipe here just use browned butter infused with sage. This sauce would work great with chicken, try adding a touch of lemon too! Over steak would be delicious, even try adding garlic and swapping the sage for thyme!